Your Credit Score will determine your Interest Rate. The APR listed below is the rate from A+ to E ratings. Annual Percentage Rate: The annual percentage rate you receive for certain sub-accounts listed will be within the range disclosed and will be based on certain creditworthiness criteria. Automatic transfer of payment and down payment discounts are available on certain sub-accounts. Ask us the rate for which you qualify. 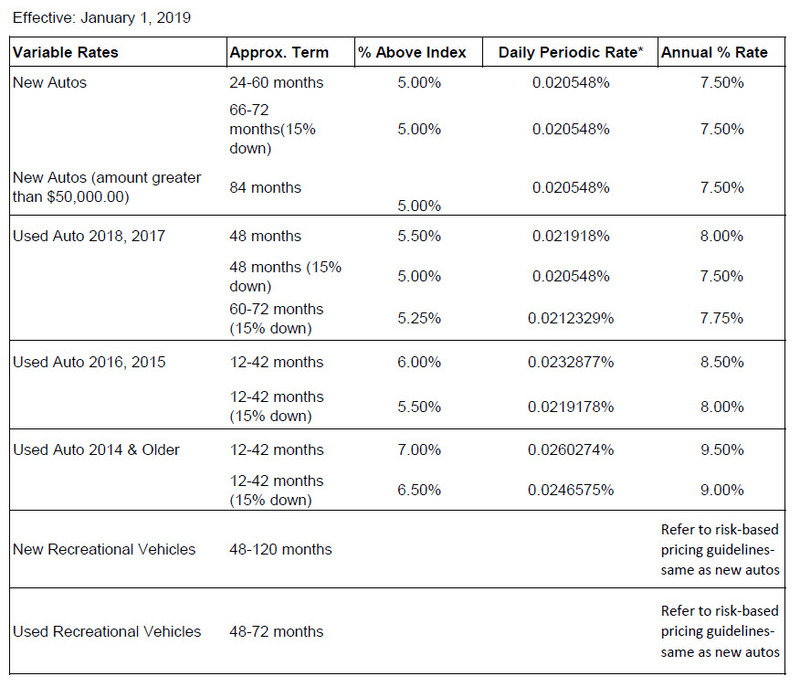 * Daily Periodic Rate percentage pertains to the lowest APR figures in a range. Late Charge: If you are 10 days or more past due on your loan, you will pay a late charge of 5% of your monthly payment, minimum $5.00. Collection Cost: You promise to pay all costs of collecting the amount you owe under this agreement, including court costs and reasonable attorney fees. 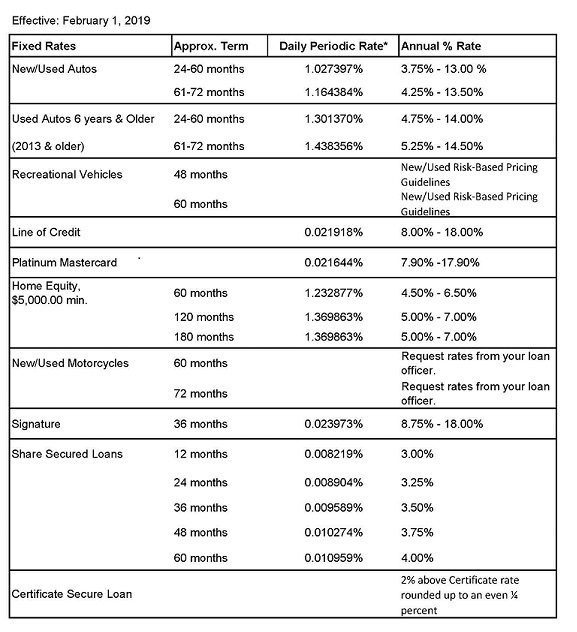 Secured Loans: The Annual Percentage Rate (APR) for new variable rate advantages and existing balances will change on the first day of each quarter to reflect any changes in the index and will be determined by taking the for week average of six-month Treasury Bills and rounding up to the nearest 1/4 of 1.00%, plus the applicable percentage rate shown above. The APR will never be more than the maximum rate allowed by law, and never less than 5.00%. Any increase in the APR will take the form of more payments of the same amount until what you owe has been repaid. Certificate Secured: The Annual Percentage Rate (APR) will be 2.00% above the Certificate rate, rounded up to the nearest 1/4 of 1.00%. When the Certificate is renewed, the APR on the loan must be changed to reflect the new Certificate rate. If the Certificate is not renewed, the loan must be paid in full, or funds placed in shares and used as security on a share secured loan. Late Charges: If you are 10 days or more past due on your loan, you will pay a late charge of 5% of your monthly payment, minimum of $5.00. Collection Costs: You promise to pay all costs of collecting the amount you owe under this agreement, including court costs and reasonable attorney fees.